Bahrs Die & Stamping Co., Inc. has been a leader in metal stamping and die making for nearly 80 years. 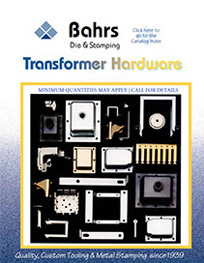 At Bahrs it is our goal to supply only the finest quality stampings to our customers at competitive prices. Quality and service at a fair price are true hallmarks of Bahrs Die & Stamping. This is not just by accident; it is a long term policy of the company. Bahrs welcomes your business. It is our sincere hope that you will come to Bahrs for your metal stamping and water jet cutting needs. Bahrs is a small company but we are a strong company. We pride our selves with superior quality and on time delivery. This is made possible by our well trained and dedicated staff that is committed to our goals of quality and service. We design, build and maintain our tooling and fixtures in house which affords us control over all aspects of the manufacturing process. Bahrs also enjoys excellent business relationships with our suppliers, who know the quality and consistency that we expect and are willing to work with Bahrs to meet any special needs that may arise in the course of a project. Bahrs Die & Stamping is Certified ISO 9001:2015. Metal Stamping Customers!! Thank You!!! Thinking about Changing Metal Die Stamping Companies? Thinking About Changing Metal Die Stamping Companies? Feel like your current metal die stamping company is holding you hostage? Take a walk through our plant to see our people and capabilities in this short video.